Another Tuesday, another challenge at Tuesday Throwdown and this week we're playing with the color wheel to show that "Opposites Attract." We want to see you use two colors which are opposite each other on the color wheel. Our sponsor this week is Craft Classes Online and you could win entry into a free class! 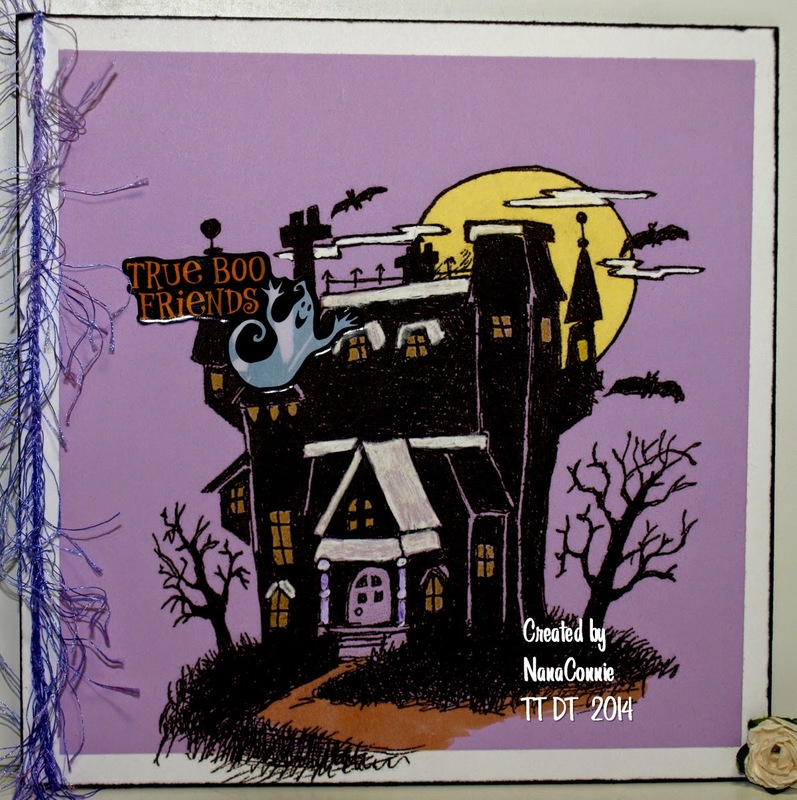 I chose purple and yellow for this spooky Halloween haunted house by QKR Stampede. This card is a little different. Instead of printing the silhouette image onto white CS, I printed it onto lavender paper and then paper pieced the yellow moon. The light in the windows is done with yellow chalks. The white on the roofs, trim, and clouds is done with white gel ink. I adhered the image to the card front and then doodled with black ink to make the grass go off the edge into the margin. The purple fibers were in my stash and I honestly have no idea where I got them although I have four or five different colors of them so I must have really liked them or found them on a clearance sale. The ghost and sentiment are stickers. Wow, that's a longer list of challenges than any I've done lately! But most importantly, I'd love to see you playing along in our "Opposites Attract" challenge at Tuesday Throwdown. 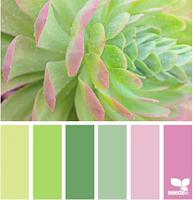 Just in case you don't have a color wheel, work with this one. OK, so my fur-babies and I were discussing Halloween the other day and I was reminding them that when the ghoulies and goblins come for Trick or Treat, it really isn't necessary for them to try to make a break-out rush through the front door; they are house cats, after all. HoneyBear, who has the attention span of a gnat, had only one question -- could they expect fish for Trick or Treat this year instead of candy? So much for my plans to eat all the Halloween leftovers! 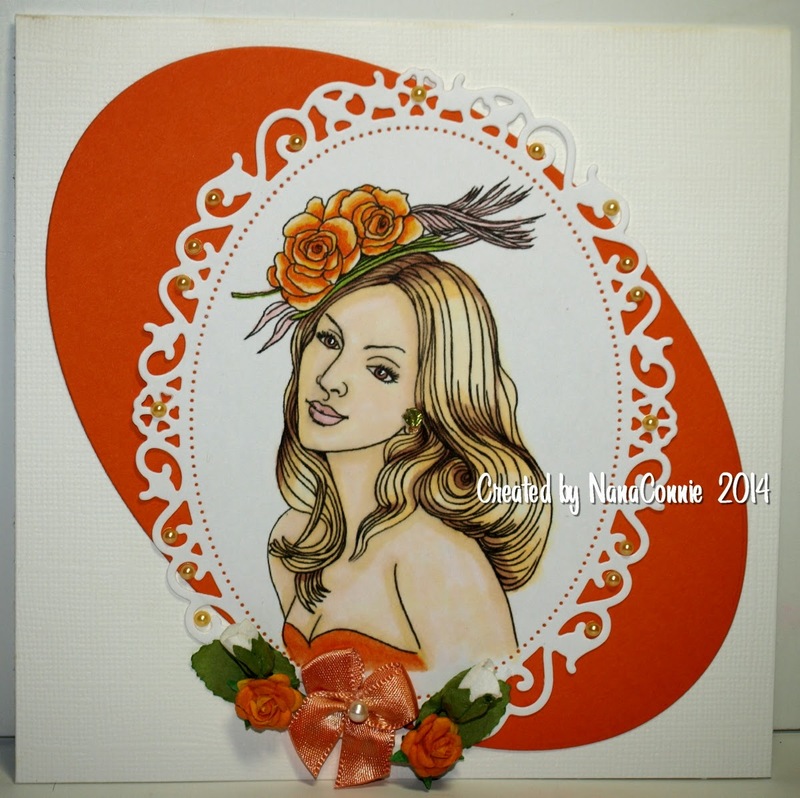 Image from QKR Stampede, colored with ProMarkers, and then die cut with a die from Spellbinders. I found a scrap of dp and die cut that for the frame around the image. Ribbon from Really Reasonable Ribbon, glitter from Stickles, and leaves from Jolee's. This is a Fitztown image which I colored with ProMarkers and then die cut with one of my framing dies from Spellbinders. I rarely work with oranges (except for fall color combos) so I had to dig around quite a bit to find the pumpkin CS which I die cut with a plain oval die from QuicKutz. At first, I intended to layer the two ovals so that the plain oval would be just a vertical mat behind the image but as I was playing around, I angled it and really liked the way it looked. I layered both pieces onto the card front and then began adding flowers and pearls. I didn't have any flowers that pumpkin color but ProMarkers fixed that. :-D I'm becoming convinced that I'll buy nothing but white flowers from now on and custom color them to whatever I need. The bow was also white but dyed with a ProMarker. OK, I admit it -- I'm addicted to QKR Stampede images! I find myself reaching into my collection of them whenever I want something fun or quirky or gently humorous. Since I'm a Guest Designer at The Outlawz CAS challenge this month, not only am I getting lots of practice on doing CAS (which I'm really loving! ), I get to put on my thinking cap, too. Our theme this week is the movie "6 Days, 7 Nights" and Pryn's advice is to "think of islands, planes, pirates, castaways, etc." What I remember most about the movie is that when you take all those things away, it's really all about falling in love. That meant this adorable image from QKR Stampede was perfect! I started with the inspiration photo from Chocolate Baroque. It's the second Sunday in September and I'm Guest Designing this entire month over at The Outlawz CAS Challenge. This week we have a challenge theme of "Girly" or "Feminine." All right, I've done my share of feminine cards so that's no big deal -- except that I make feminine cards with tons of lace and ribbon and flowers and bling and... Yeah, you get the idea but this card has to be CAS. In case you're wondering, yes, I did have a conversation with myself and it went this way, "OK, I made a commitment to do CAS at Outlawz for this entire month and I'm going to do it!" First I want to share the card and then I'll tell you the other side of the story. The image is from Rick St. Dennis and he's a great sponsor of challenges at Outlawz. I knew I wanted to use this image since the pumpkin is a great symbol of fall and harvest and Thanksgiving. But fall colors are hard for me when I'm trying to think "girly." For me, pink is the color that says "Feminine," not orange or brown. Then I remembered -- a couple of years ago my daughter saw some pink pumpkins for sale. Not painted or dyed but real pumpkins that are pink when they grow. The lady selling them was donating the proceeds to Breast Cancer Research. That was near and dear to my heart since I'm a BC survivor (13 years this month! :-D ) My daughter and I have already decided that next year we are going to grow pink pumpkins and sell them to donate funds to Breast Cancer Research, too. You can find more info on the Pink Pumpkin Foundation by clicking on their name. The image is colored with ProMarkers, then die cut and matted. Because I wanted a feminine feel, I decided that some lace with pink ribbon woven through it would make a good single embellishment. After all, this is CAS not vintage! :-D I laid it diagonally across the card front, than added the image piece, popped up on dimensional dots. I have it on good authority that despite the lace and ribbon this card still qualifies as CAS -- minimal embellishment, lots of open space, and clean lines. I have to combine two of my favorite challenges (and add a few others) with this delightful image from QKR Stampede. I know I've already posted today but as soon as I saw the Paper Playful list of Friday challenges, I knew this card had to be done right away. :-D It's total silliness in honor of All Hallow's Eve and fall. 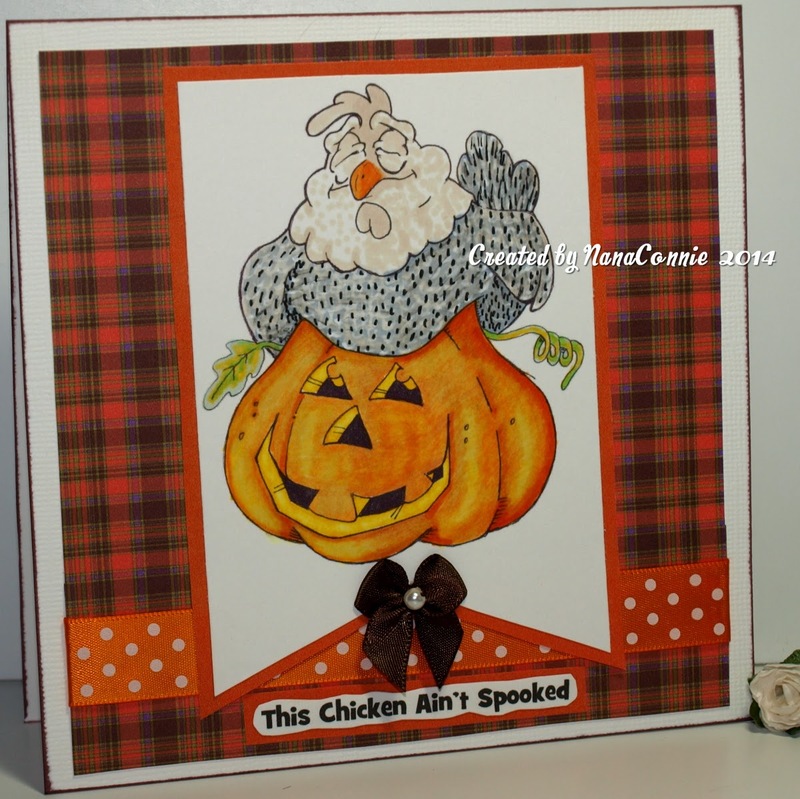 I'm not sure if the chicken is 'sitting' the pumpkin or if the pumpkin is wearing a 'chicken' hat! and the colors came from the inspiration photo at Die Cuttin' Divas. 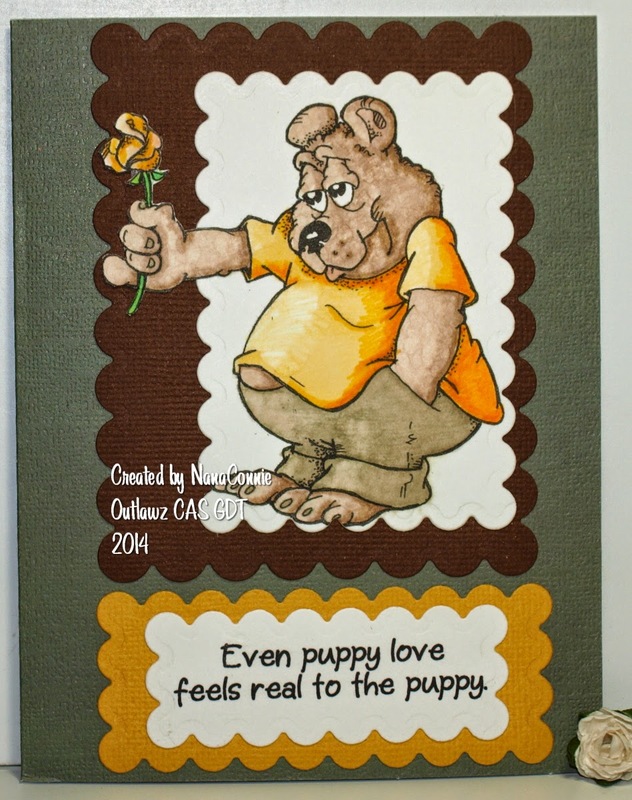 Through The Craft Room Door, September 2014 Issue is now available for your viewing in the "Subscribers Only Area" at Through The Craft Room Door website: http://craftrmdoor.ning.com. It is loaded with paper craft tutorials, tons of inspiration, and projects you can create. Come see Colleen Schaan's craft room - trust me, it will knock you off your feet - it totally rocks . Art by Miran is this issue's Featured Digi Artist and has given the subscribers the sweetest digital images to download. Come on over and join us and try one of the great tutorials! Another challenge starts to day at Through the Craft Room Door, always "Anything Goes," and we love seeing what you create and submit. We're sponsored this time by AuroraWings (I love their digis!) 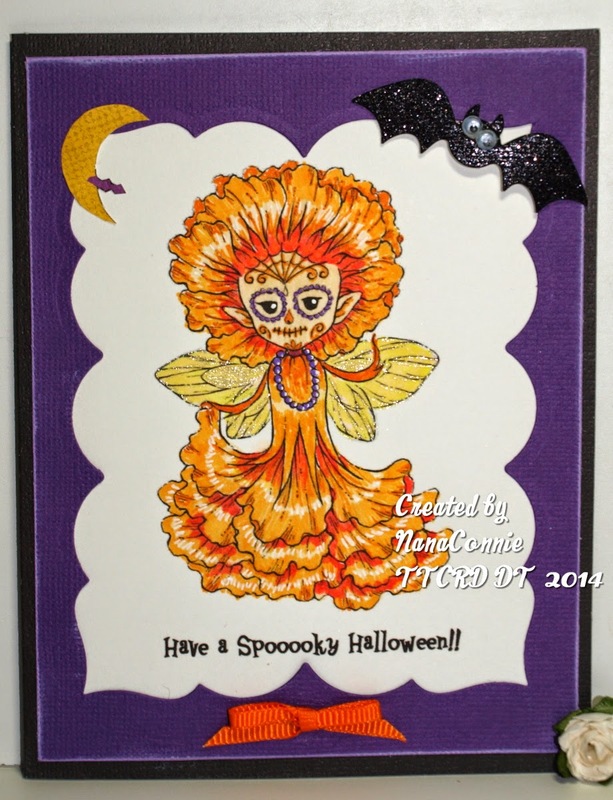 and I chose to do another Halloween card using an image from their Fairies collection, called "Day of the Dead." 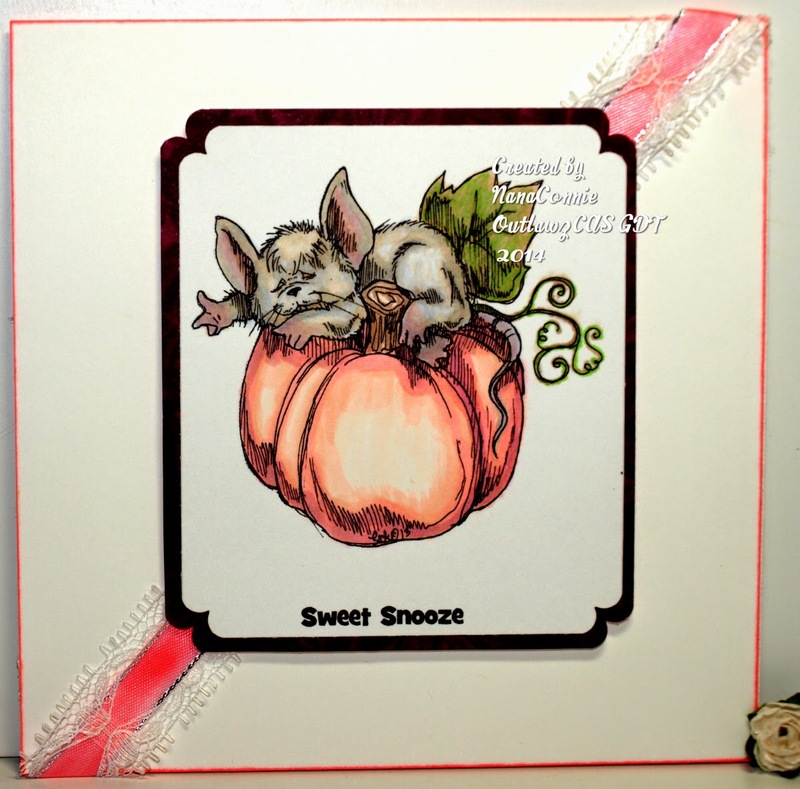 The details and the materials list for this card are published in the new September/October issue of the magazine and I really hope you're a subscriber so that you can see all the tutorials and projects. Believe me, you don't want to miss out! I will tell you that I've used one of my favorite techniques which is to "frame" the image with the negative piece of a die cut. The purple frame is laid over the image instead of the image being cut out with the die. I am delighted to announce that I've been asked to be a Guest Designer for September on the Sunday CAS Challenge at The Outlawz! All I can say is that someone has a much better opinion of my ability to create Clean and Simple card designs than I have myself. I think I still need loads of practice but every once in a while, I get one right. :-D Let's hope I get a few of those this month. 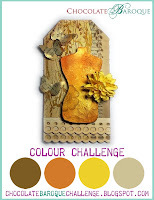 Our challenge theme this week is done in honor of the lovely fall colors which will be taking over the northern hemisphere soon, so Use Your Favorite Colors. But they can be from any season. I chose to use fall colors because I'm so ready for cooler weather. This one uses a darling image from Squigglefly. I know it's been around for a long time (last year? two years?) but this is my first time actually using it. 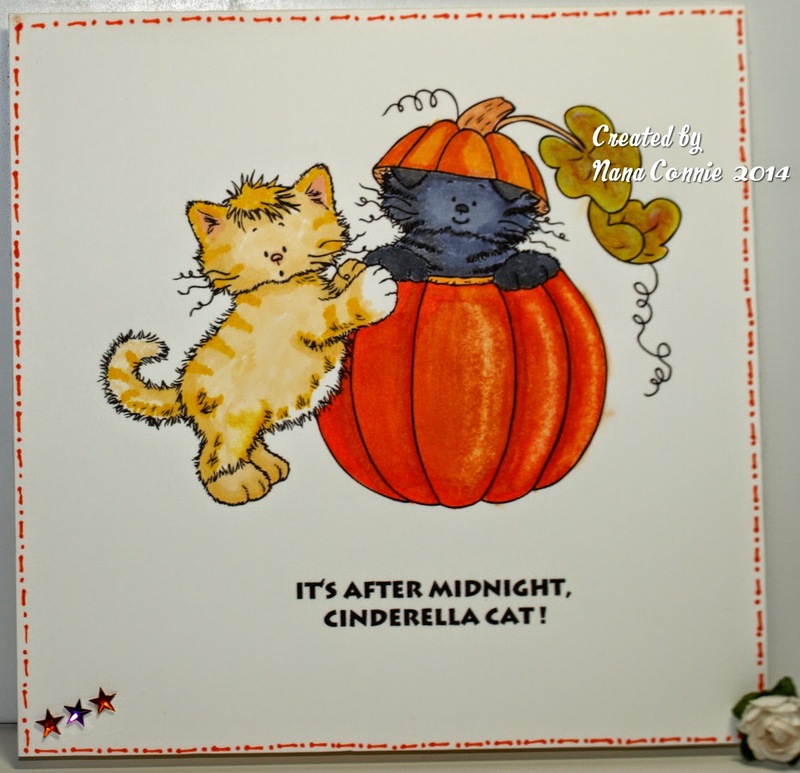 Those two kittens with the pumpkin just made me think of what would have happened to Cinderella's coach right after midnight. Hence, the silly sentiment. I used the colors from Mema's. 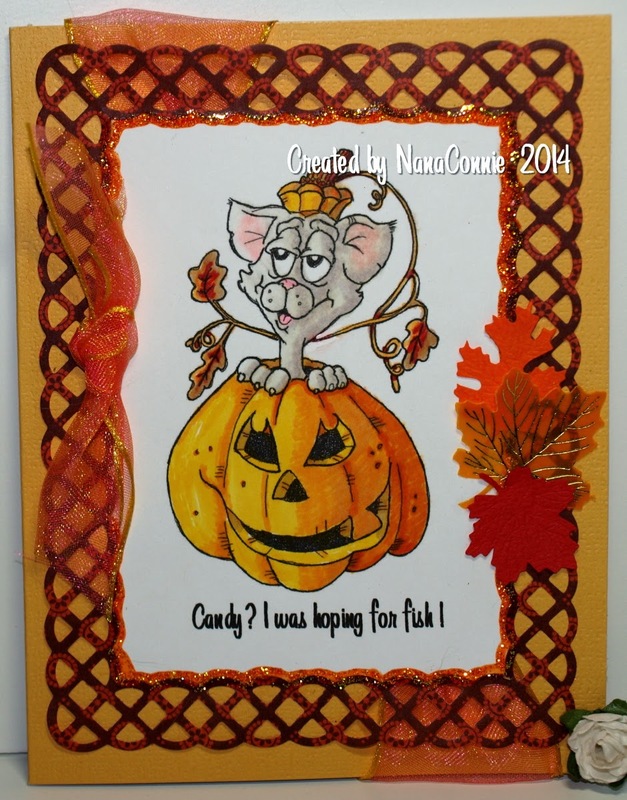 This is a single layer card, colored with water colors, and I added faux stitching with an orange pen. The only embellishment comes from the three tiny stars. Not much more to say given how simple this is.